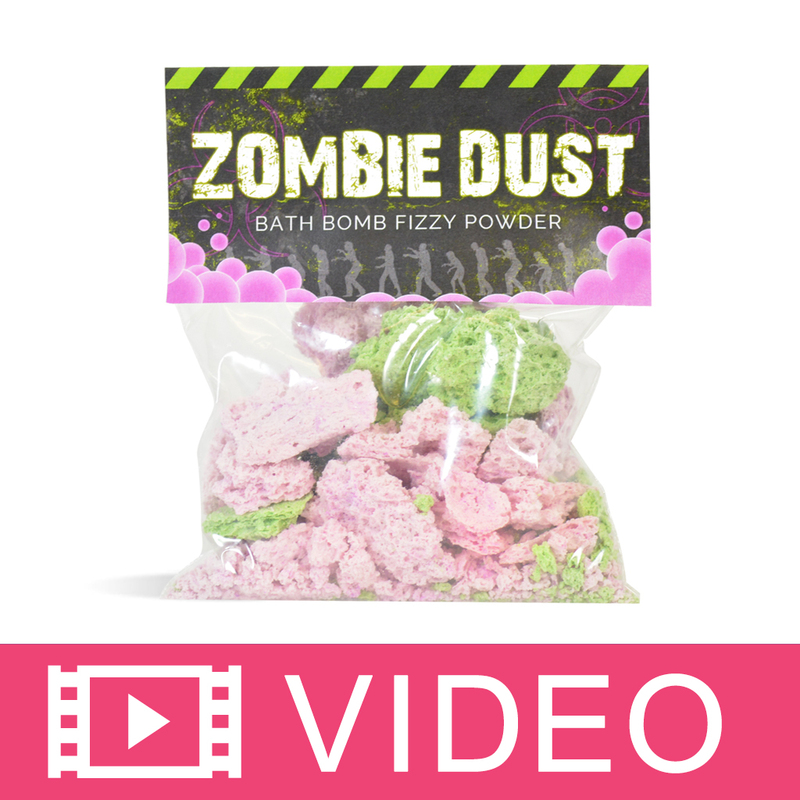 Amuse children with this fun zombie dust bath fizzy kit. The fun continues in the bath tub! Create this fun project with kids around Halloween. We love the way this zombie dust foams up while it's drying! It looks like its rising from the dead; children will be entertained and have a fun treat for bath time when the project is finished. You Save $29.55 by purchasing this kit rather than buying the items separately. COMMENTS: I think the scent on these, and it is a fun product. The only thing is, it does not bubble up much. I expected a lot more bubbles? Also, be sure to watch over the mixture while making. It expands a lot in the end. COMMENTS: I already had the ingredients so did not purchase as a kit. Made the first batch with one granddaughter and it turned out perfectly. The second batch was prepared at an altitude over 5000'. It never quit growing until it began to dry. Everyone thought that was fun but when dropped in water the fizz was missing. Still a good project to make with young children. COMMENTS: I love this, it was so easy and my nephews loved it! Made my whole house smell like bubble gum! And when I gave my nephew a bath in it he felt so moisturized... it is great stuff, and for the price I will be buying again! COMMENTS: There is nothing in this kit I did not like. Very generous in the amount of product given and very thorough instructions. My favorite was the graphic they so generously gave so my packages look fantastic!! • Leftover color & fragrance to make more! COMMENTS: This is too much fun. It's worth buying just to watch it grow-kinda like those magic rocks. I changed it up a bit and divided it into three colors-orange, purple and green and added some colored sugar crystals and colored baking dust. I am going to change the scent on the next batch to something for teenagers and rename it something only they will find appealing-especially the boys. Thrilled with this as child/teenager product. COMMENTS: I purchased this kit, not really knowing what to expect. I was amazed at really how easy this was to make lol. I got this kit to test it with some of my family members who have kids, and before I could get all of the products out to friends and family to test my nephew grabbed two bags and ran for a bath lol. I recommend this to everyone! COMMENTS: This was actually fun to make. It was like a little science experiment. Smells amazing even for bubblegum. Cannot wait to see how my customers like it. "I see a couple other people have already asked about labels and I’m aware you don’t have one to download. I’m wondering if it comes with the kit (one person said they received the graphic for labels), or could you make it available? This is a unique item and personally speaking, the label creation would take longer than making the product itself. I’d like to try many seasonal recipes but don’t for this reason. Thanks"
Staff Answer We do apologize. We are not sure how this link was removed from the recipe. We have now added it back on and you should be able to print the labels. "Hello, I was wondering if you could add the cocoa popz to this recipe and if yes, how much to this kit?" 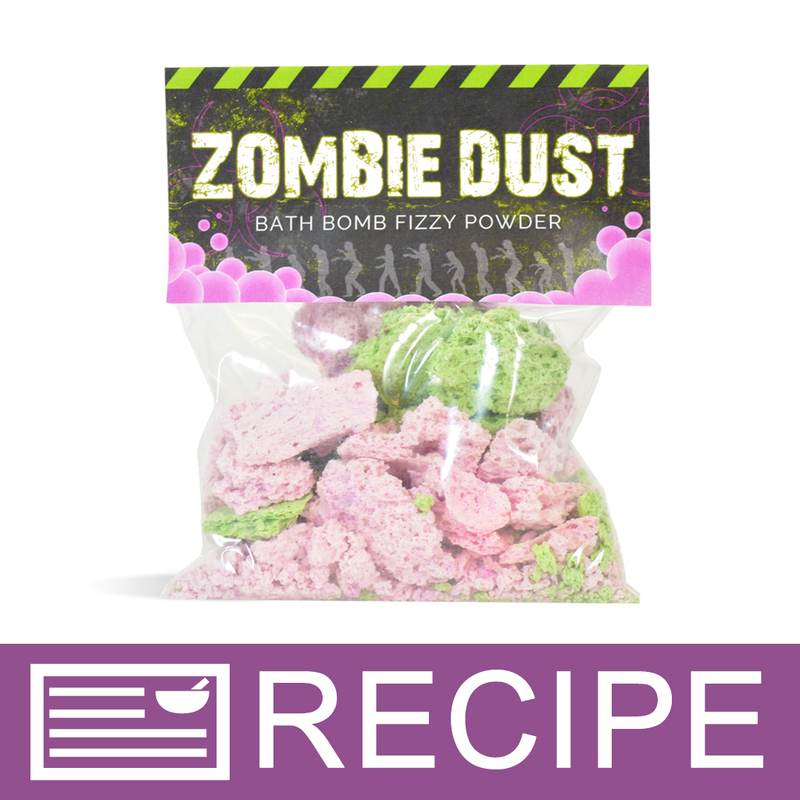 Staff Answer This would not work because you must add these to a dry recipe such as bath bombs or bath salts. The Zombie Dust mixture is wet which will activate the cocoa popz. The only way to use in this recipe would be to sprinkle in the bag when packaging. "Where do we find the label to print out please?" Staff Answer The label shown in the video and photo are just an example of a label. We do not actually have a downloadable label for you to print. "Can milk powder be added to this to create the foaming bubble effect? If so how much would you recommend? Also howmuch slsa if going that route?" Staff Answer This product does foam when added to water. You would need to test any changes to this recipe as it was designed with these specific ingredients. Any changes may alter the outcome of the product. "Are the individual bags of zombie dust, one usage?" Staff Answer Yes, each bag is intended for a one time use. "I made this but very disappointed. It says that the fun will continue but there were hardly any bubbles to start with. Can I put twice the amount of the Bubble up in this recipe? " The Bubble Up in this product is designed for product creation not for bubble in the finished product. The recipe is for a Bath Fizzie which should ultimately produce a fizz when added to water. If you are looking for bubbles, we do not recommend adding additional Bubble Up because it is a liquid. Rather, you can add Lathanol Powder for a bubble effect! "are your products save to use among children?" Staff Answer We recommend that you check with your pediatrician before using a new product on your child. "Does this kit include the "Zombie Dust" paper label? " Staff Answer We are not offering this label as a template at this time. This label was included to inspire your own creations.